The Catholic Hour - Teaching the True Catholic Faith and condemning Modernist errors. 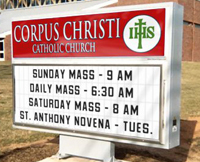 You are invited to attend Mass at Corpus Christi Catholic Church, 1114-30th St., Lubbock, TX. Only Latin Masses are said at this parish. Our phone number is (806) 744-6363. Daily Mass is at 6:30 a.m.; Saturday Mass is at 8:00 a.m.; Sunday Mass is at 9:00 a.m. except once a month. Read the streaming schedule below for current information. Call ahead for weekday Masses (to make sure Father is in town) because Fr. Joseph travels during the week. This parish is under the auspices of the Franciscan Friars. Each Friday in Lent Stations of the Cross 7:00 p.m.
April 5 & 6, 2019 First Fri. & Sat. 6:30 a.m. & 8:00 a.m.
April 7, 2019 Passion Sunday 9:00 a.m.
April 14, 2019 Palm Sunday 9:00 a.m.
April 15, 16 17, 2019 Mon., Tues., Wed. in Holy Week 6:30 a.m.
April 21, 2019 Easter Sunday 5:30 p.m.
April 28, 2019 Low Sunday 9:00 a.m. Teaching the True Catholic Faith and condemning Modernist errors. The Catholic Faith Radio Program is broadcast live each Friday from 1:30 to 4:30 p.m., Central Time, on KRFE 580 AM, Lubbock, TX, USA. You are cordially invited to call in with your questions or comments at this number: 1-806-745-5800. Click here to go to The Catholic Faith Radio Program page. Guests and Topics are subject to change. Corpus Christi Radio Program is broadcast live each Sunday from 7:30 to 8:00 a.m., Central Time, on KFYO 790 AM & 95.1 FM, Lubbock, TX, USA. You are cordially invited to join us.